This is nice and hot! Made with very spicy habanero oil we recently picked up, it will bring an awesome flame to your palate. 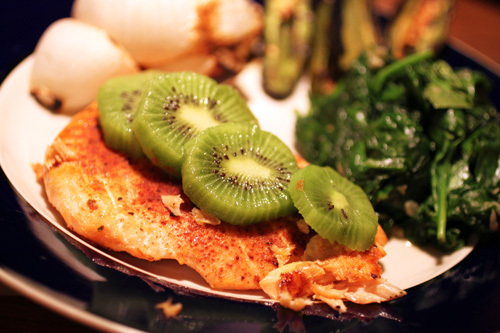 The coolness of the kiwi is a nice contrast to the heat and texture of the salmon. Season salmon fillets each with 1 tablespoon chipotle powder. Get both sides. Set salmon fillets onto a large square of tinfoil and top each with habanero oil. Fold the tinfoil over, ensuring the oil does not run out. Set on grill and close. Grill about 10-12 minutes total over medium heat, or until salmon is cooked through and no longer pink in the middle. Top with kiwi slices and serve! We served ours with some seared spinach and garlic, along with grilled onions and jalapeno pepper halves for extra heat! You’ll absolutely adore the smoky flavor of the chipotle powder. Delicious stuff.